On September 19, Peekapak hosted an EdTechTO Meet Up for EdTech leaders in the Toronto area. 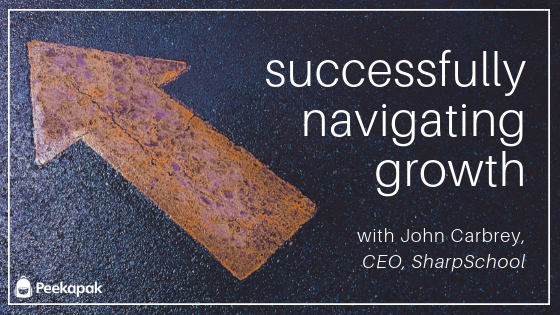 John Carbrey (Founder and CEO) and Joshua Auslander (CFO) shared the story of SharpSchool’s growth and acquisition by SchoolMessenger. Carbrey and Auslander discussed what they did to set up SharpSchool for growth and success and how they navigated the selling process. Here are some of their insights based on their story. Evaluate your org chart. Are you missing any key roles? As your business grows, you may find that the CEO has too many direct reports or that there are certain roles filled, like a Marketing Manager, but not an HR one. Maybe the CEO is managing both the Marketing and HR departments. To help set your company up for growth, consider hiring fractional executives. These executives can provide leadership and guidance in certain areas of your business for just a few days a week. For example, you could hire an HR Manager who works for two days/week. Fractional executives can also help you identify and train potential future leaders within your company by providing them with professional development opportunities. A company is created by the vision of the CEO and this vision guides the business through its initial development under the CEO’s watchful eye. However, if growth is to happen, the CEO must take a step back and allow the rest of the team to take ownership of the vision. When this occurred at SharpSchool, it was a pivotal moment for the company. During an off-site workshop, SharpSchool’s leaders gathered, identified what they wanted their respective teams to look like in the future, and put together plans of how to get there. This was all done with little input from Carbrey, outside of setting the vision, though he was present at the event. This helped transfer accountability for executing the vision from Carbrey to the rest of the team and helped empower them to perform more independently. This process helped identify the leaders in the organization. There were even some surprises, as new, unexpected leaders emerged. Your goal when building your business should not be to sell it, it should be to build the business. When planning and making projections, think long-term. Having these plans will also help a lot if you are approached by a potential buyer. It will help show them the value of your business which may help convince them to buy! Join us for our next EdTechTO event! Peekapak hosts regular meetups for EdTech leaders in the Toronto area. If you are interested in joining our invite list, send a message to hello@peekapak.com and we will be sure to invite you to future events! Our next meetup will be on October 16th.